As of July 1, 2018, Inspection Services Division (ISD) and Zoning Division fees increased by approximately 2.5 percent for all permit types. Department of Environmental Services (DES) development-related fees also increased; these fees changed by variable amounts. Applications submitted on or after July 1, 2018 will automatically be charged the new amounts. Fee schedules provide the range of fees charged for each type of application or activity related to land development in Arlington County. Fees cover permitting, plan review, enforcement, inspection, service delivery; and performance agreements and conditions required by Federal, State and/or County regulations. Arlington County’s adopted FY 2019 operating budget included increases to fees for various County services, including Department of Community Planning, Housing and Development (CPHD) Development Fund fees and Department of Environmental Services (DES) Permit fees. Increases are based on many factors, including the cost of the service being provided, inflationary adjustments, and fee levels in comparable jurisdictions. Departments review their fees on a regular basis and propose changes, when appropriate, during the annual budget process. When will the new permit fees go into effect? The new permit fees go into effect Sunday, July 1, 2018; applied to permits processed on or after this date. The increase is approximately 2.5 percent to the Development Fund Fees (Inspection Services & Zoning). Department of Environmental Services (DES) permit fees vary, please check DES Fee Schedules. Why is there an increase in the permit fees? 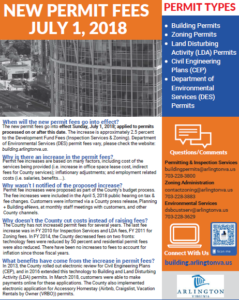 Permit fee increases are based on many factors, including cost of the services being provided (i.e., increase in office space lease cost, indirect fees for County services); inflationary adjustments; and employment related costs (i.e., salaries, benefits…). Why wasn’t I notified of the proposed increase? Permit fee increases were proposed as part of the County’s budget process. The fee increases were included in the April 5, 2018 public hearing on tax & fee changes. Customers were informed via a County press release, Planning + Building eNews, monthly staff meetings with customers, and other County channels. Why doesn’t the County cut costs instead of raising fees? The County has not increased permit fees for several years. The last fee increase was in FY 2010 for Inspection Services and LDA fees, FY 2011 for Zoning fees and FY 2014, the County decreased fees on two fronts: technology fees were reduced by 50 percent and residential permit fees were also reduced. There have been no increases to fees to account for inflation since those fiscal years. What benefits have come from the increase in permit fees? In 2013, the County rolled out electronic review for Civil Engineering Plans (CEP), and in 2016 extended this technology to Building and Land Disturbing Activity (LDA) permits. In March 2018, customers were able to make payments online for these applications. The County also implemented electronic application for Accessory Homestay (Airbnb, Craigslist, Vacation Rentals by Owner (VRBO)) permits.